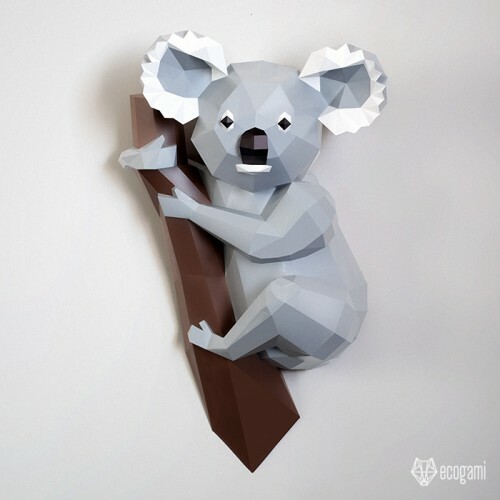 Make your own papercraft koala with our printable PDF pattern! It’s easy! Just follow the instructions & you will be proud of your Australian icon on your wall. Isn’t it a nice & unique wall mount decor for your sweet home or even a gift for an animal lover or an Australia lover? Don’t be afraid, I assembled it myself, so everybody can do it! You will just need time & precision. Put your music on & enjoy the assemblage! (For me it is a perfect way to relax). ► Difficulty Level: Medium – The eyes, the nose and the white part of the ears are elements that require more attention.